The Evolve 80 has superior Active Noise Cancellation and Passive Noise Cancellation, in an over-the-ear wearing style, to shield disruptive background noise. The Jabra EVOLVE 80 MS Stereo is a professional headset designed to improve concentration and conversations. Premium noise-canceling technology gives you peace to work in the noisy, open office effectively creating a concentration zone around you, so you can stay focused on the job. The speakers are built for style and comfort with leatherette ear cushions, and are specifically designed to reduce office noise. 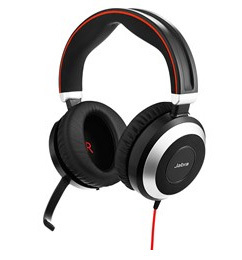 When combined with active noise-canceling technology, you get maximum protection against office noise. The concentration zone is completed with a busy light indicator that signals user availability to colleagues. Let you and not the task decide where you work. The Jabra EVOLVE 80 comes with a 3.5mm jack stick incorporated into the control unit giving you the freedom to connect your corded headset to PC, smartphone or tablet. The control unit also supports comfortable and easy access to most used functions, such as volume. You are also able to answer calls and close calls directly at the control unit thereby increasing your overall flexibility, so you can better focus on the conversation. When not on a call or when you are on the go, the microphone boom arm can be seamlessly integrated into the headband - so you can easily turn your office headset into a personal headset. The Jabra EVOLVE 80 MS Stereo is optimized for Microsoft Lync, providing instant “Plug & Play” installation for your headset. The headset works perfectly with your Microsoft Lync, so you can focus on the conversation.